Back to School Lice Checks: Should You DIY? The beginning of a school year is an exciting time for your child. A new class, a new teacher, new friends, and new opportunities to learn. For parents, it is just as exciting to watch them thrive and enjoy their time at school. However, the school year comes with a few downsides. It is much easier for germs to spread and for children to get sick in such a large group setting. Beyond your typical illness, there is an even more inconvenient pest that can make its way around a class in no time at all – head lice. If you have ever dealt with head lice, you know that it is no walk in the park to treat. You have probably heard of, and may have even utilized, over-the-counter lice treatments – but do they really work? Do you know how to properly check your child’s head for lice? Learn more about back-to-school lice checks and whether or not you should leave this task to the pros. Always act quickly when it comes to a possible lice infestation. But better yet, be proactive. When your child gets home from school, make an effort to comb your child’s hair and look closely for any possible nits (lice eggs) or the tiny insects themselves. What can be tricky about lice is that everyone thinks a typical indicator is an incredibly itchy head and scalp. But, only 50% of people with a head lice infestation will experience itchiness. Your child could easily be one of those cases, so it is best to check routinely rather than waiting for symptoms to appear. Over-the-counter treatments contain harsh pesticides, which can be problematic, especially for youngsters. They can easily burn scalps, and can be extremely uncomfortable when left on for any duration of time. Some of these treatments can be up to four times the strength of an intensive insect repellant. 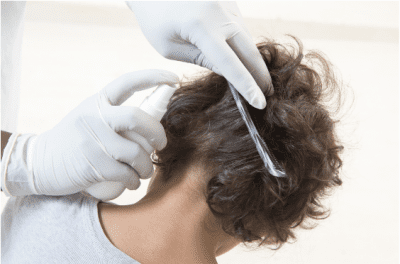 On top of that, lice have developed a resistance to many of the properties in these OTC treatments, so your child may receive a large amount of chemical exposure for ultimately nothing. Effective lice treatment takes painstaking, layer-by-layer combing out of nits and adult head lice. 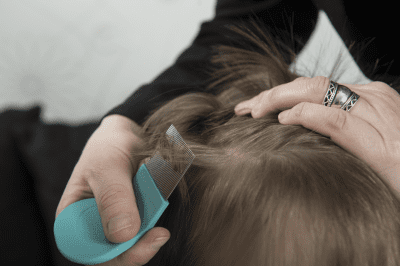 This alone is reason to see a professional; at Lice Lifters, we use a micro-grooved comb that is specially designed to remove any traces of lice and nits. It will catch every strand, which is part of the reason we can say that we are a one-time visit to a guaranteed lice-free head, if you keep up with our home instructions. Our proprietary treatment solution is 100% pesticide-free, will kill lice at all growth stages, and is not at all irritating. Perhaps we are a little partial, but we stand by what we do, and we know that our lice treatment is much better than any over-the-counter treatment you can buy. At Lice Lifters, we do not need pesticides to kill all lice at the source and end your problem right then and there. 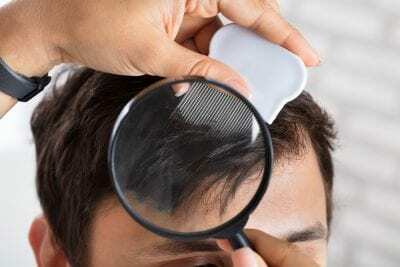 We know firsthand that it is necessary to comb out lice-infested hair meticulously, and someone who has never done that before might inadvertently miss a section. This is why for lice treatment, it is best not to go DIY. Schedule an appointment today by calling Lice Lifters in Frisco at 972-805-1308. 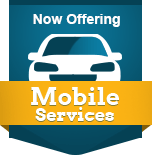 We also offer mobile lice treatment service. Over-the-Counter Lice Treatment, Yes or No? When your child comes home with that telltale itch, you know something is wrong. It could be head lice, or it could just be some dirt from their time at the playground. But if it’s the former, you may feel the need to panic. Hold on – take a deep breath, step back, and then act appropriately. It’s not the time to panic. Your first instinct may be to visit the drugstore in town for a quick solution. However, we promise that those over-the-counter lice treatment products do not work. There is no doubt that they fail to provide a prompt or effective solution. In fact, most just worsen the situation via the hard-to-pronounce chemicals within each bottle. Do yourself and your child a favor, and just avoid that path altogether. Okay, let’s break down your typical over-the-counter lice treatment. Whether it’s prescription, store brand, or Nix, there are chemicals in each bottle. Pesticides, in fact. Such pesticides include Pyrethroids and Pyrethrins. These products do not work to treat head lice. Today’s head lice, which we often refer to as “super lice,” are resistant to such chemicals. You’re simply introducing a new, more harmful product to the scalp. Furthermore, most over-the-counter lice treatment packages come with a comb, correct? Well, we hate to break it to you, but the comb fails in every way. The teeth of the comb are too far apart, making it quite ineffective at removing head lice. You may snag a few here and there, but overall, it’s not worth your time. So, why not use pesticides? Well, pesticides are directly linked to cancer, seizures, autoimmune disease, and behavioral problems. If your child is already itching, you do not want to risk introducing another problem to the situation. The itch is likely bad enough. There are nearly 12 million cases of head lice reported each year, according to the Centers for Disease Control. A quick trip to the drugstore is not enough to handle the “super lice” of today, which make up 95 percent of all reported cases. Instead, you need professional aid. The treatment at Lice Lifters is more thorough, effective, and safe for both children and adults. An experienced and certified technician performs the procedure. We use only all-natural, pesticide-free and soothing products, which have a 99.9% guaranteed effectiveness. Head Check – A technician will sift through the hair, section by section, in search of nits, nymphs, and adult lice. Comb-Out – Using a special micro-grooved comb, your technician will meticulously remove stubborn nits from the hair shafts. All-Natural Killing Agent – Finally, the all-natural killing agent is applied to the hair and scalp. This gentle solution works immediately! Again, Lice Lifters keeps you safe from toxins, too. Overall, it’s a simple, effective method. Schedule lice treatment services in DFW with Lice Lifters by calling 972-805-1308. Beth Kirschner is the owner of the Dallas Fort-Worth branch of Lice Lifters. Reach out to her via Facebook or Twitter.